On Sunday former UFC flyweight champion Demetrious Johnson will fight outside the Octagon for the first time since 2010 as he makes his debut for ONE Championship. The card, dubbed “A New Era” will feature the first round of a flyweight tournament. Johnson is a heavy favorite in the field, and he is the only fighter in the bracket who is currently ranked inside the top 10. It will be interesting to see how ONE progresses as a promotion with a few high level signings and a new U.S. television deal. In the past, high profile fighters, such as Ben Askren, have struggled to maintain their Fight Matrix ranking due to lack of competition. How will it effect Johnson’s legacy? Given the lack of depth of the flyweight and bantamweight divisions outside of the UFC, it will be hard to see how ONE will provide strong opponents for Johnson without co-promoting with another promotion like Bellator or Rizin. Even those two companies had to join forces to make a super fight for champions Kyoji Horiguchi and Darrion Caldwell. 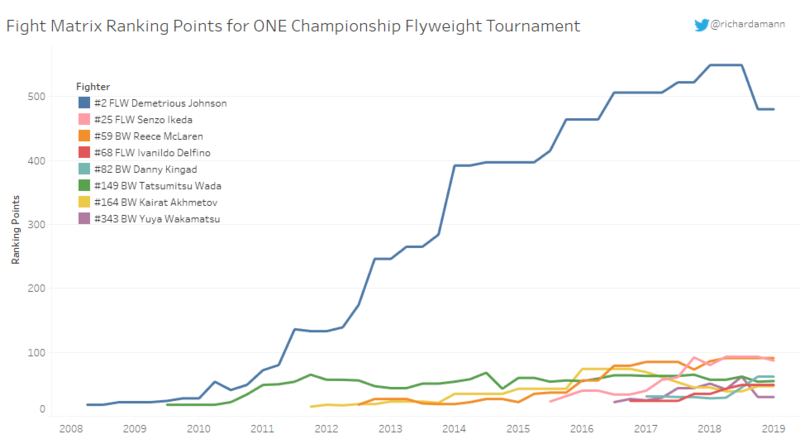 The following chart shows the career ranking points for all competitors in the upcoming ONE Championship flyweight tournament. An interactive version is available via Tableau Public. Richard Mann is a regular contributor to @espnmma, @FightMetric, @RotoWireMMA and @InterMat. You can follow him on Twitter at @richardamann.